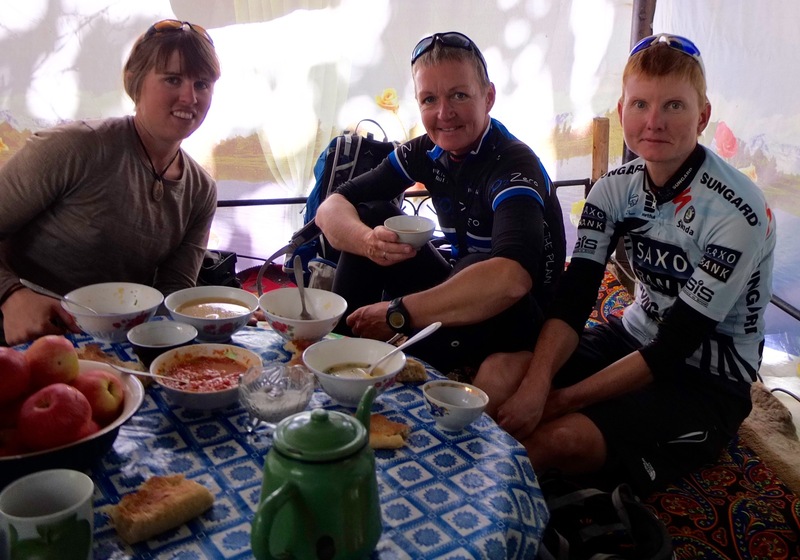 I was very happy to hear that my friends Marianne and Heidi had decided to join me for a day of riding before returning to Khorog to start their journey back home to Denmark. 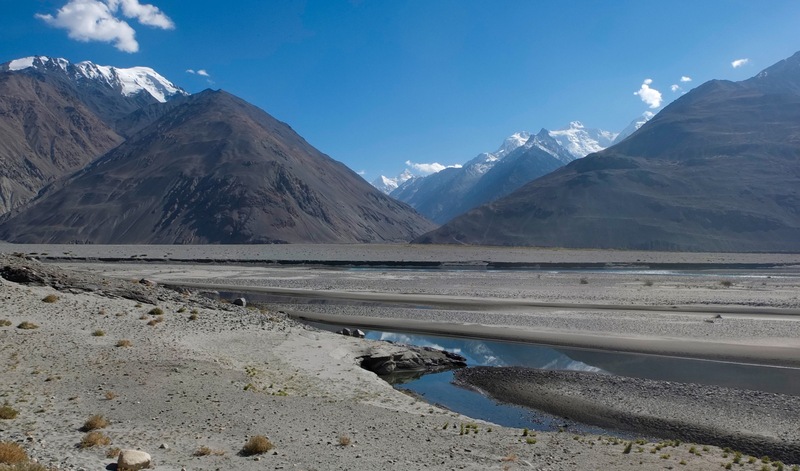 We were entering the fabled Wakhan Valley, where I would trace the border of Afghanistan that lay on the other side on the Panj river. 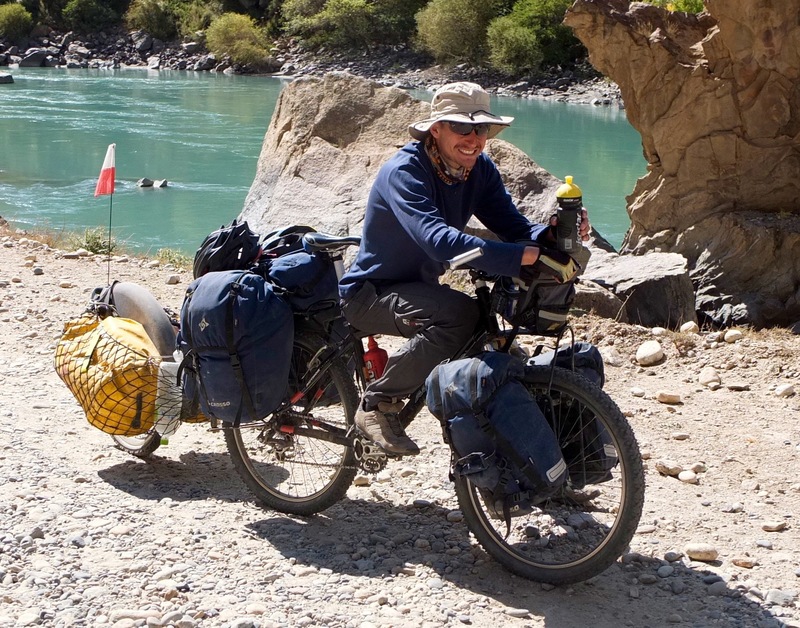 We pedalled along the weaving road, with dramatic brown cliffs rising on either side of us. The children were even more enthusiastic in this area – they repeated “hello! hello! what is your name?” with more fervour than usual, while laughing and chasing the bikes. Early in the day we ran into a lovely Polish couple Marta and David that Marianne and Heidi had cycled with earlier. They had a unique set up with Dawid carrying most of the load at 65kg. I complain about my heavy load at 35kg…this guy had 65! Marianne, Heidi and I stopped for lunch just by the river’s edge below the road eating sweet buns with spreadable cheese. A group of school children stopped above to wave and stare at us. One little girl had a bag with her and motioned for us to come up. I went towards her and she handed me a large bag of apples with a smile. I happily took it, not knowing exactly how we would carry 10 apples with us. Further down the road we whizzed past a house and suddenly I heard “chai!” The girls did not hear the man so I called out to them “hey guys! chai! chai!” We were in no massive rush, so we decided to take up the offer of hospitality. We were led through a small gate to a sitting area near the back of the house. There sat an older woman with a very young child in her arms and a couple of men. We sat on the cushions surrounding a table and were given amazingly fresh bread, tea and tasty soup with mutton, potato and chives. As usual we did our best to communicate through gestures and the few words in Russian that we knew. “Harasho!” was one that was used often, meaning “very good!” We were given yet another bunch of apples to take with us. We didn’t have the heart to say no, so now we probably had about 20 between the three of us! 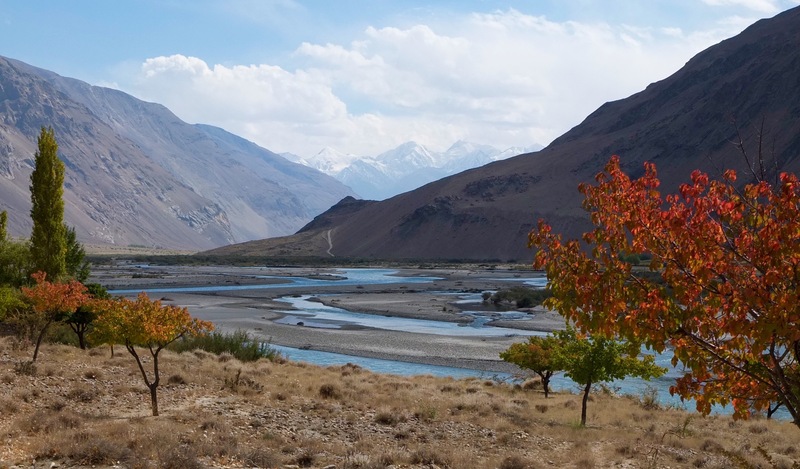 This was just the start of the incredible Wakhan hospitality. At the police checkpoint. 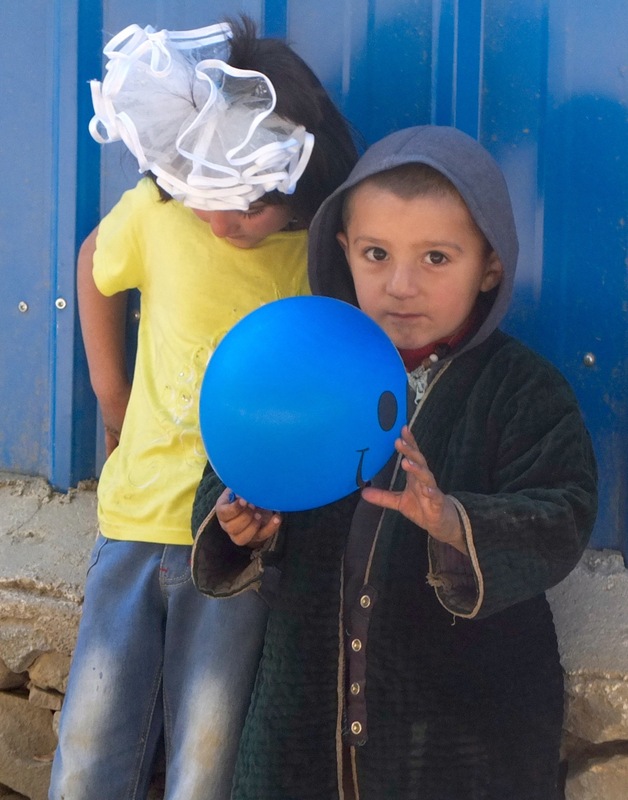 Marianne made this little boy very happy by blowing up a balloon for him. We continued to enjoy the ride, eventually coming up to a police checkpoint. Luckily this was quicker than rest and I wasn’t pestered with questions about my missing husband and children. 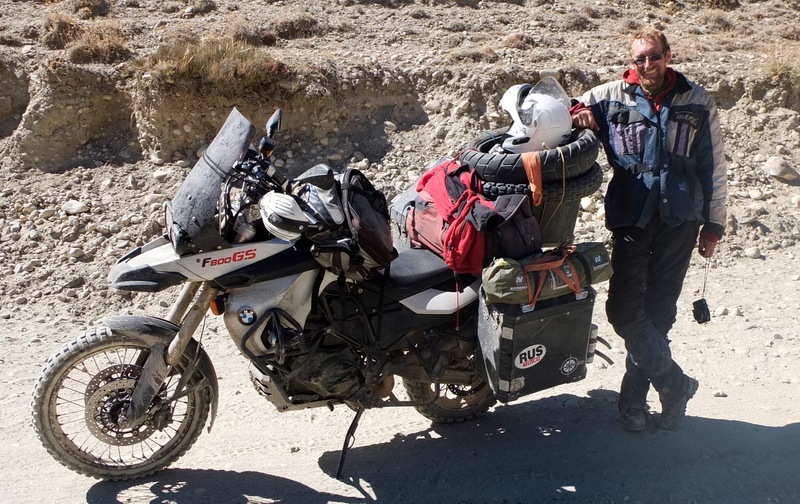 We had only planned to ride about 50km that day and we soon started to look for a place to camp. We thought it might be a good idea to ask permission to camp in front of a house. Marianne approached a woman working in her yard to ask. We were welcome. Later, the man of the house brought us out some fresh nan (bread), a big thermos of tea and another bag of apples! Humbled by their generosity, we graciously accepted. The stars were mind-blowing that night. It was great to sit outside with my friends to appreciate the beauty together. Sometimes life’s greatest moments are best shared. Goodbye to my Danish sisters. A sad morning. 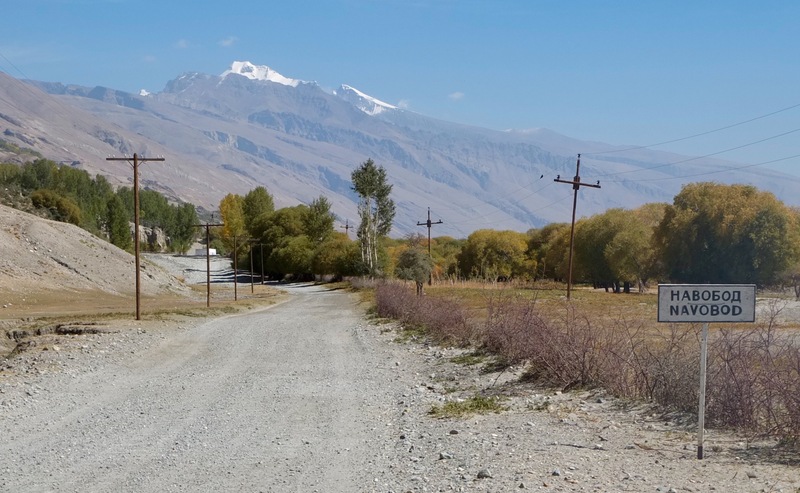 We had a tearful goodbye the next morning as Marianne and Heidi had to return to Khorog, where they would catch a jeep to Dushanbe and fly home to Denmark. 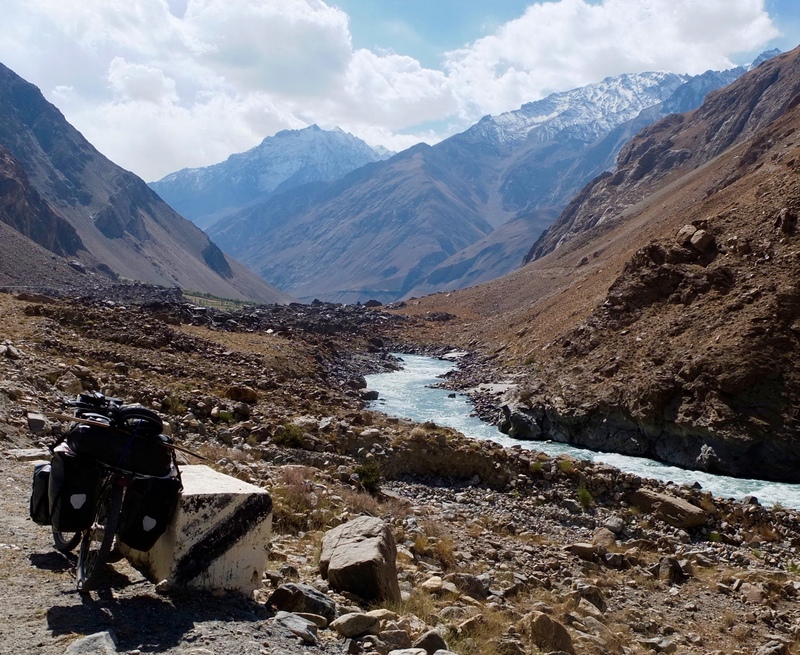 It was unfortunate that Central Asian bureaucratic nonsense had stopped us from riding the Pamirs together. Still, I was grateful that we were able to meet one another for a few very enjoyable days. It is always strange to suddenly be alone again after being in such good company. I don’t experience loneliness until I am occasionally reminded of the joys of being with friends and sharing the experience. My mood lifted as the narrow corridor along the river started to open up. 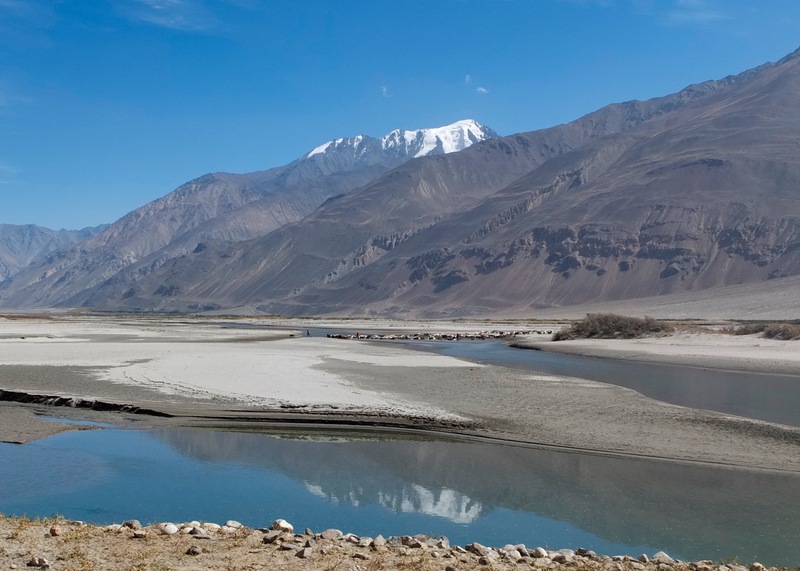 The views revealed snow capped mountains- Afghanistan’s Hindu Kush reflected in glistening blue waters. Populars lining the road showcased their brilliant fall colours. I had a tailwind and the air was cool and crisp – the perfect temperature. This was blissful cycling. Even though the riding was wonderful, I could really feel the fatigue setting in at the end of the day. The constant “hello! hello!” from the kids had also started to get on my nerves. I camped at a lovely homestay in Ishkashim and had a massive meal of plov, a typical Central Asian dish. This was rice cooked in fat with carrot and onion, topped by a few chunks of mutton. By now I was also drinking copious of the local green tea and it was some of the tastiest I’ve had. I was told by other cyclists to stock up on supplies in Ishkashim as food would become more limited further down the road. As my Snickers supply was running dangerously low, I figured this would be wise. The ride only got more and more beautiful. Sometimes I would stop just to try and process what I was seeing, locking it into my memory. I was given many enthusiastic waves, including the Muslim greeting of “Asalemu Laykum!” and asked “akuda?” (“where are you from?”) In the small village of Darshai I was approached by a girl that spoke good English. She invited me in for chai and asked if I was looking for somewhere to stay the night. It was still fairly early in the day, but I got tempted in by the cozy home and decided to stop for the night. 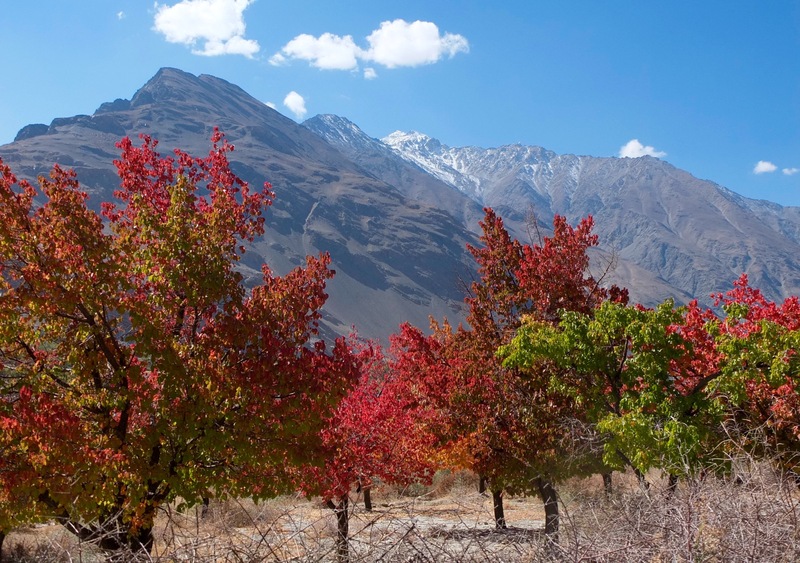 I enjoyed talking to the girl who had gone to University in Khorog to learn English. Then, I met her wonderful sister that had an adorable little boy named Yusuf. Even without a common language, the two of us really connected. When I met people like her, I wished that we could communicate on a deeper level. She had an infectious smile and I loved her friendly and outgoing personality. She was my age, 29. She ended up giving me a pretty beaded bracelet that I still wear to remind me of our meeting. In my travels, I have met so many wonderful people, but there are a certain few that stand out the most in my memory and she is one of them. From here, the decent roads started to become a distant memory. Enormous potholes, washboard and rock became more common. It was exhausting on the roller coaster road. I was steadily climbing in elevation and the landscape drier and more barren. 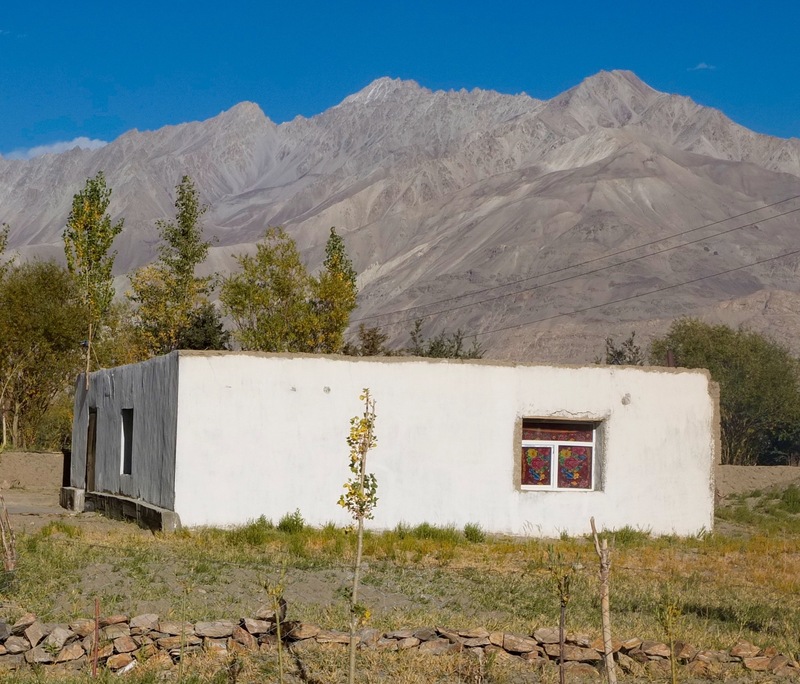 I had planned to stopped in Zong at a small homestay but the owners seemed pretty disinterested in my request to stay. I decided to ride the next few kilometres towards Langar, before I saw another “homestay” sign. I turned down a rocky side street and went to the first home that I saw, asking about a homestay. The woman pointed down the road, but offered that I stay with her instead. I was in a strange mood that night. I was feeling melancholy for a reason that I couldn’t really understand. Maybe it was a combination of fatigue and the lack of a common language that was suddenly making feel distant, lonely. As usual, I was shown such kindness by a total stranger and this brought me comfort. She took me into the main room covered in elaborate carpet on the walls and floor that was customary of a Tajik home. She sat me down,brought me tea and then some pillows to prop up behind my back. Later she wrapped a jacket around me to make sure that I wasn’t cold. Next came bread and the amazing homemade butter that I couldn’t get enough of. When she asked me if I spoke Russian I replied “choot choot” (very little). Despite this she spoke to me in Russian throughout the night, assuming I could understand. Even though I would give her a confused look, she would smile and continue to talk. Later I met her kind husband, who put on some Pamiri music for me to listen to. For fun he showed me some of the dance moves. It was the same that I had seen at a birthday party in Khorog. My strange mood was starting to lift all thanks to the company of my new Tajik family for the night. When I reached Langar I had hoped to buy a few supplies to last the next few days. To my disappointment I only found one tiny shop after asking around for its location. The dusty shelves were barren, only stocking cookies, candy, sugary juice and noodles. I didn’t know how I would make it through without my beloved Snickers. On the climb out of Langar, I was in dire need of a sugar boost. 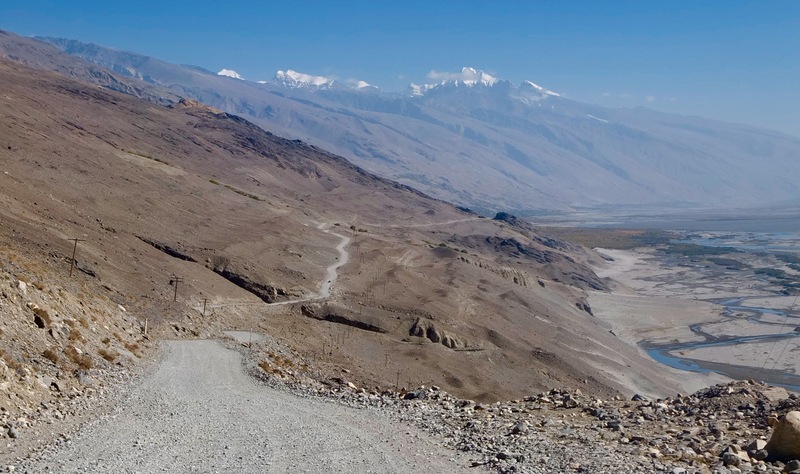 The road climbed in steep switchbacks out of the village, turning into a rocky sandpit. An enthusiastic boy from the village found me and offered to help me push. He helped me heave the bike for about 100m. In the end he reached his hand out. I can imagine he tried to turn his services into a full time job for passing touring cyclists. I handed him a 3 somoni note (about 50 cents) and he was very happy. Then he gave me a handful of dried tamarinds and waved goodbye, jogging down the road. 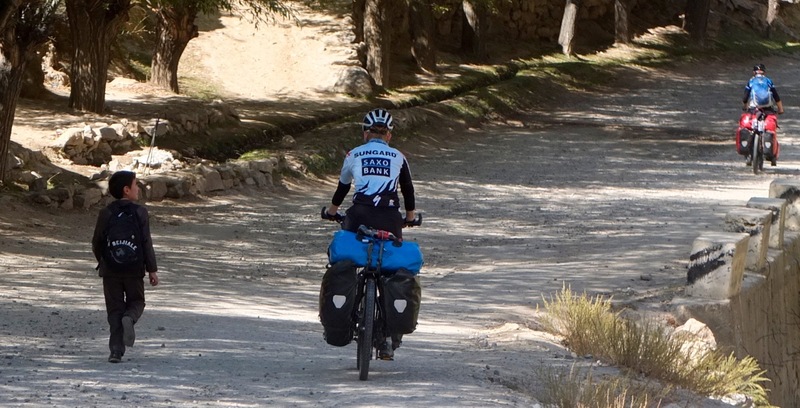 I attempt to cycle up the steep road, but the sand became too deep and I was back to pushing. It was a hard, slow climb. I felt like I was now getting into true isolation. The only vehicle I saw all day was a Romanian motorcyclist, who was just as surprised to see me. It was nice to have a real conversation in English again! He told me that scenery ahead was quite something, which gave me motivation to keep pedalling in my state of exhaustion. I was climbing above 3000m now. 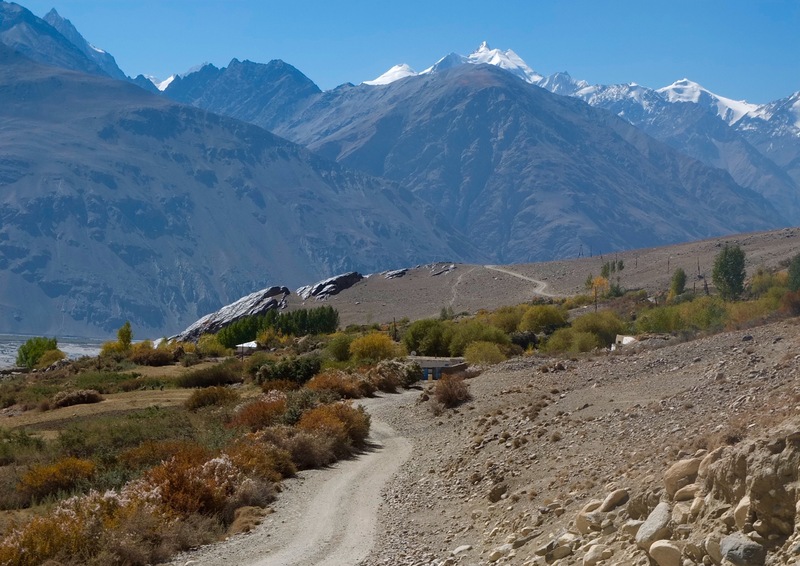 I wasn’t having problems with altitude sickness because I was still acclimatized from my ride in the India Himalaya. Still, the lack of oxygen and the steep rough roads were completely draining my energy. The route was superbly remote. And the views – jaw-dropping. 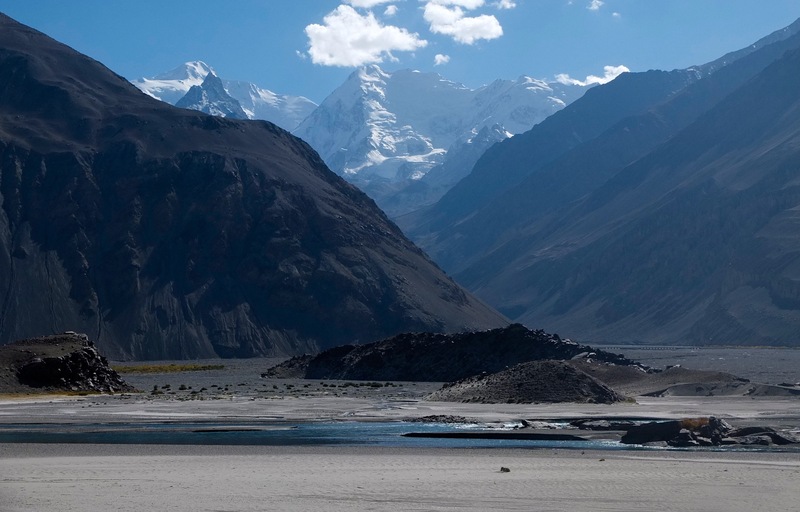 I camped just below the road beside a river at 3600m. The cold was starting to set in at night. 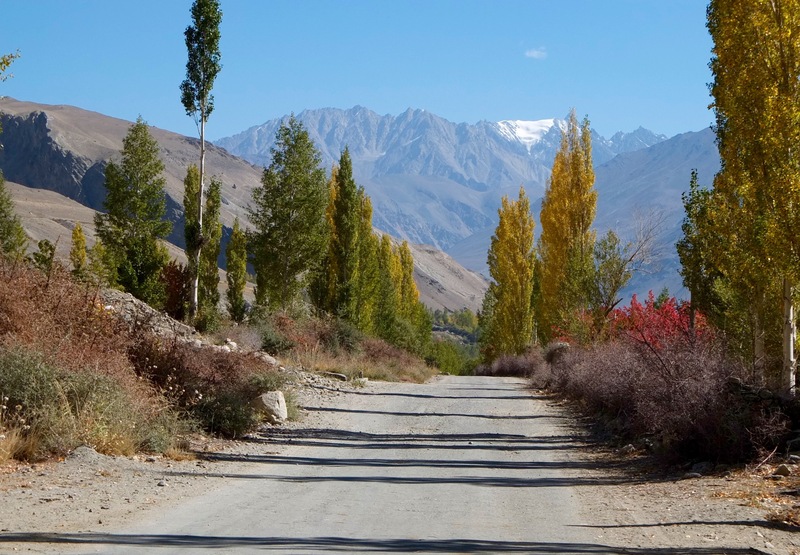 I was climbing high onto the Pamir plateau, leaving the warmth of the Wakhan Valley. Even though the weather was superbly clear, fall was disappearing fast and winter was sneaking its way in. The next day was very tough. The roads were quite sandy and I lacked the energy to move forward. 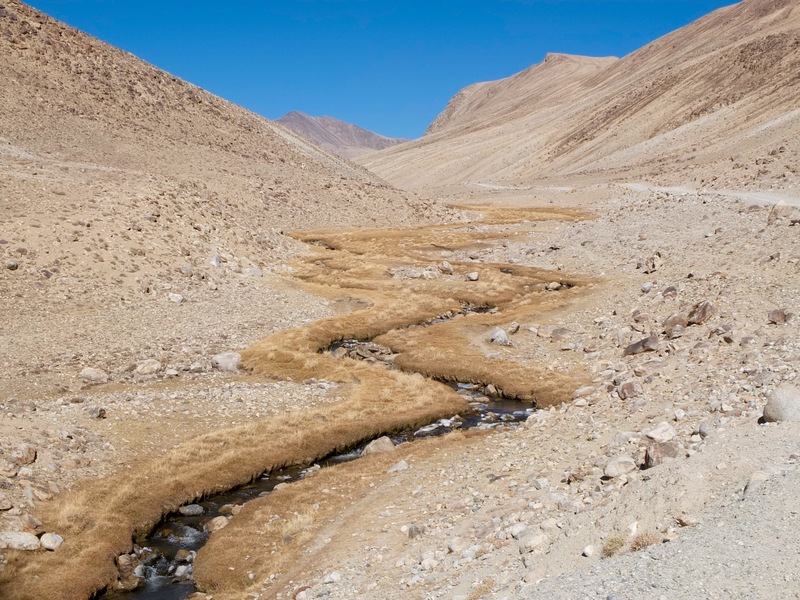 The land was beige coloured and barren – a sort of rugged moonscape. I could count on one hand the number of vehicles that I saw all day – a few jeeps and military trucks. 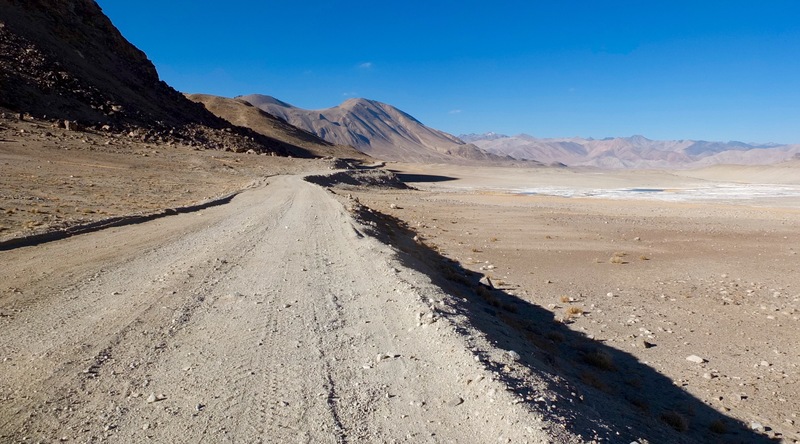 I had plans to do an adventurous detour via Zorkul Lake from Khargush military base. 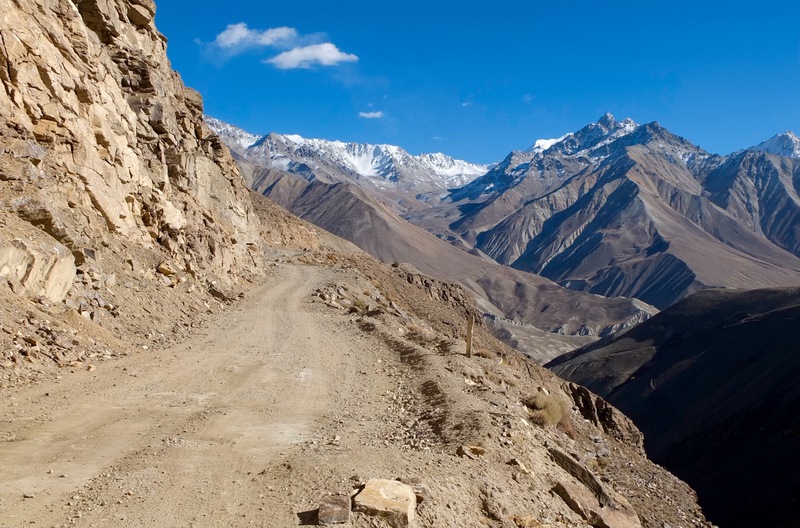 This route would take four days longer to get to Murghab on more rough road. In my current state, I was unsure if I had the energy to tackle the route, even though it sounded spectacular. 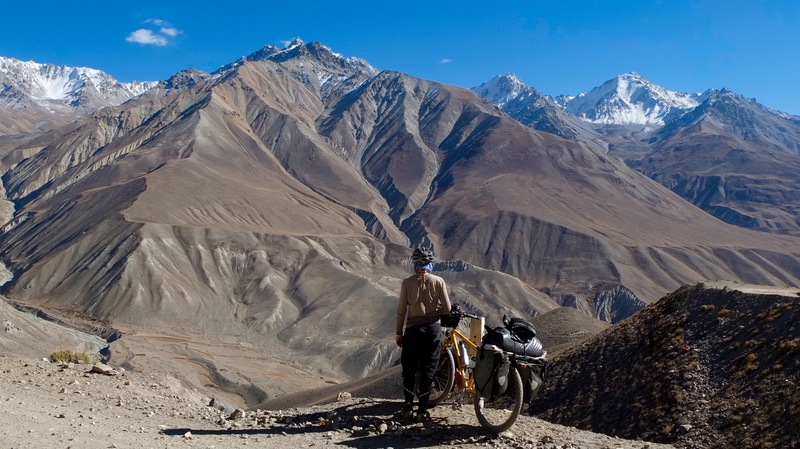 I camped about 10 kilometres below the military base after being fed up with riding washboard. One look at a steep hill ahead and I was finished for the day. I was at low point in the trip – all of my energy had vanished. I had hoped the next day would be better. It was a frigid morning – my bottles were half frozen. Winter’s icy breath had coated my tent and the ground in frost. My morning routine was taking considerably longer, while I tried to keep the blood flowing to my numb hands and feet. My energy level was at an all-time low and I feel like I barely made it to the military base, 8km away. When I arrived I was greeted by the bored soldiers and handed them a pack of cigarettes as a nice gesture (to avoid a monetary bribe). 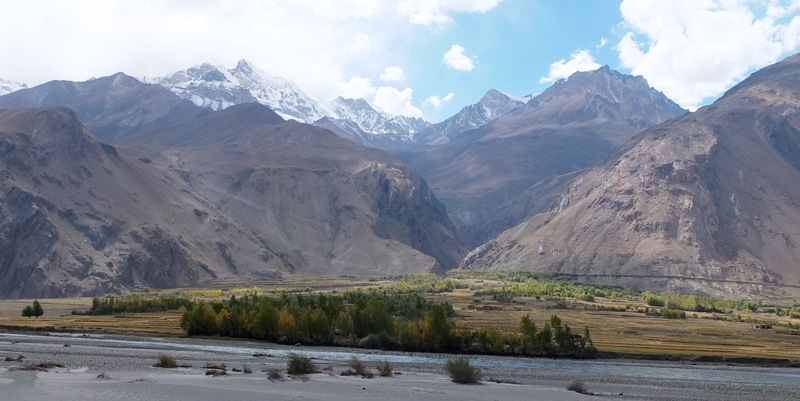 I then decided not to take the longer route Zorkul route as I didn’t have the energy for it and it would be tight anyway with the time left on my visa. 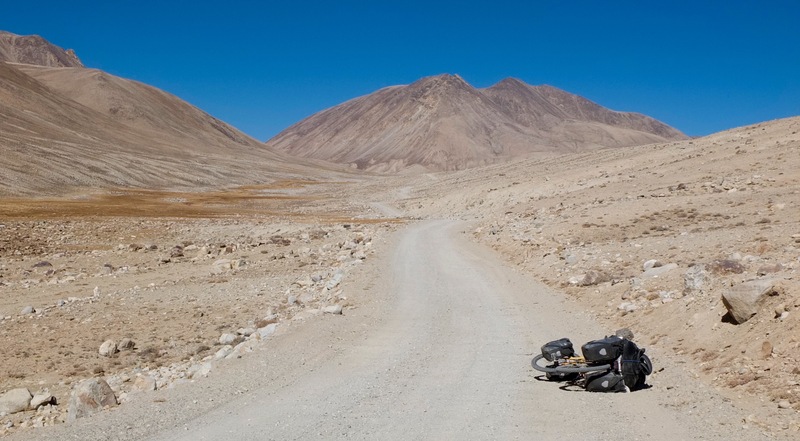 I turned left instead of the planned right towards the Khargush pass at 4344m. Now I really felt like I had made a lunar landing. The pass was surprisingly gentle and I was happy to finally be able to descend after two days of non-stop climbing. From Langar I had ascended about 1600m. Later in the day I saw some cyclists approaching me. It was a sight that suddenly got me very excited, because I had so little human contact in the last few days. It was a Polish couple headed the other way. We talked for quite a while. They told me that there was a Malaysian solo cyclist, Phoebe just ahead of me. I had originally heard about Phoebe in Dushanbe, who had stayed with Véro before I did. I was hoping to catch up to her. 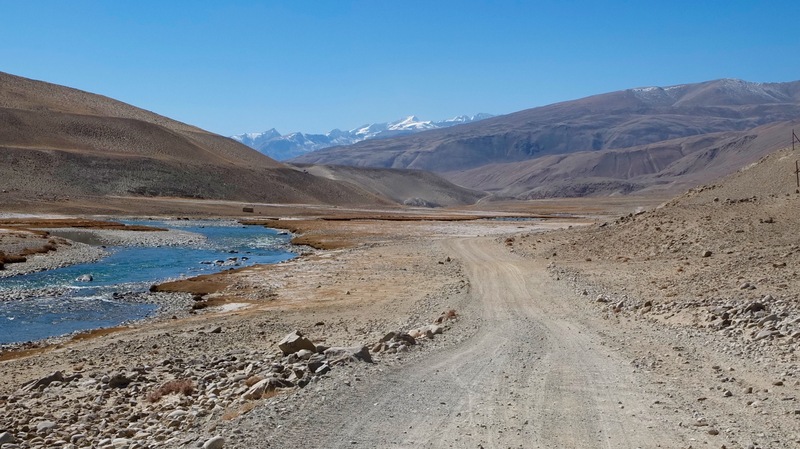 After 3 tough days, I was excited to hit the smooth tarmac of the Pamir highway. When I did, I felt like I had suddenly switched from cycling to flying. Sweet, smooth bliss. As much as I love off road cycling, my body was tired and enjoyment had turned into a chore. I covered the 24km from the junction to Alichur in just over an hour, when this kind of distance had been taking me three hours in the last few days. 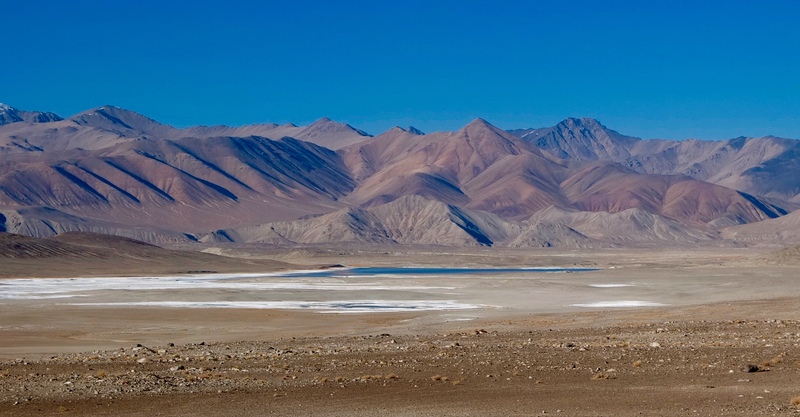 The landscape was vast with smooth mountains and striking salt lakes. I arrived in Alichur just as the sun was setting. I saw Marco Polo homestay painted in large letters across a small house and immediately headed towards it. Alichur was a very desolate town. 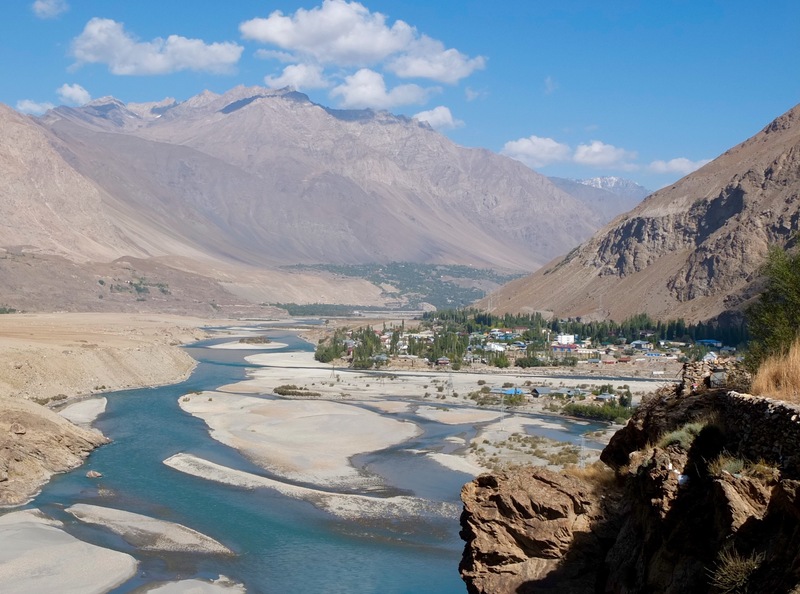 A tiny, windswept community perched on the roof of the world. 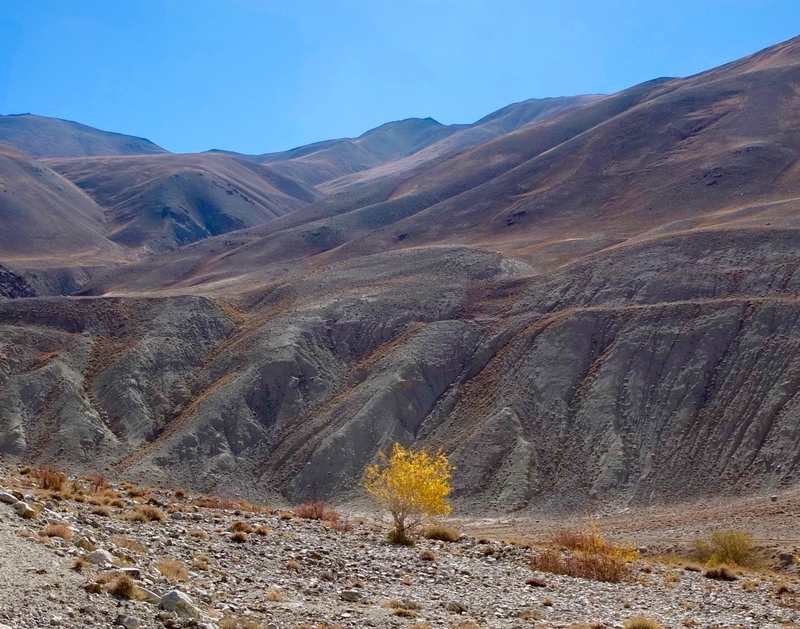 Marco Polo was a wonderful place to stay the night, run by a friendly Kyrgyz family. It was coziness personified. I lost count of the cups of green tea I drank, sitting close to the blazing wood stove. I was given a huge meal that I consumed far too quickly. The home stay had a guestbook and I read the entries of various other cyclists I had met on the road in different parts of the world. 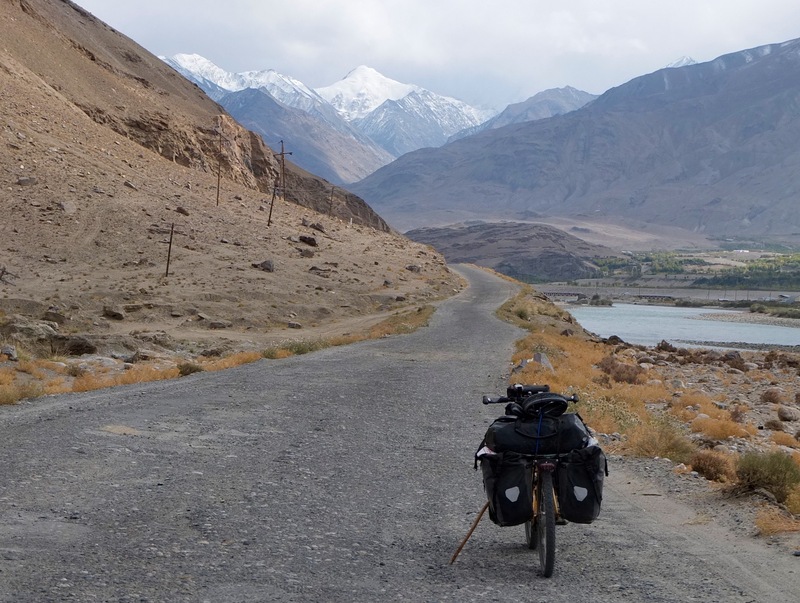 The cycle touring world is a small one. I was also told that I was the first Canadian to stay there. That night, I had everything I could possibly need: a good meal, a bottomless pot of hot tea and a warm place to sleep. Sometimes a tough time on the road is worth it in the end – to appreciate the simplest of joys that are often taken for granted. 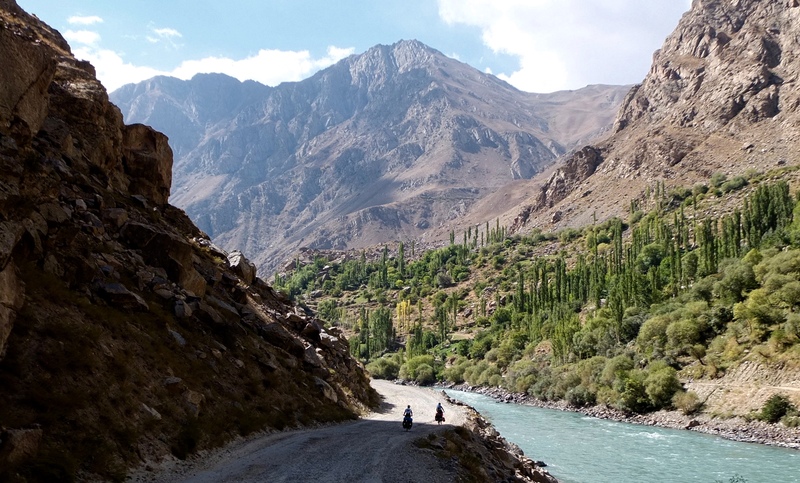 This entry was posted in Tajikistan by taraleighweir. Bookmark the permalink. Tara I am so enjoying your blogs. So well written and the pictures just keep getting more beautiful! So looking forward to the next blog on your great adventure! xo! Tara, what a fabulous adventure, your photos are amazing! Thank you so much for sharing this. It brings back so many moving memories from that valley. That place will stay with you forever, I am sure.